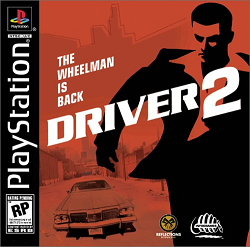 Driver 2: The Wheelman is Back (AKA Driver 2: Back on the Streets) is the vehicle simulated action game sequel to the original Driver game on Playstation. It is a tough act to follow, but we look at whether or not the sequel lives up to the standards set by the original Driver. This sequel was released 2000 which was just one year after the release of the original Driver. The game follows closely with a lot of features that appeared in the original Driver game. You are essentially a wheelman (named Tanner) as part of an undercover operation to infiltrate and stifle organized crime. In this particular game, you are trying to track down a guy named Lenny who, although works for organized crime, is experiencing reservations in continuing his career as a criminal. Many people are after him and it’s up to you to get to him first to answer questions about a murder scene. There are a lot of differences between this game and the original, but also a lot of similarities as well. One change that’ll be immediately obvious is the dropping of the training level. In the original Driver game, you had to perform a series of stunt manoeuvres to complete a check list in a limited amount of time in a closed parking lot before you even get a chance to enter the streets. In this game, that feature was dropped and you can dive straight into the action. Personally, I thought that while the training level fit well with the storyline, was a frustrating and essentially unnecessary level. So, it was a good thing to axe. Another set of features that make their return to this sequel is the map system. Essentially, you follow a shadow on your map until you find a flashing lens flair somewhere. That is your destination. When you arrive, you drive to a floating arrow which points you to a more precise location. This was a really well done feature in the first and I thought it was great that this feature was retained in the sequel. It wasn’t broken before and it was hardly fixed in the sequel. The only change was that the arrow doesn’t change at all if you have to lose a tail. I don’t know why that feature was canned, but apparently, developers thought that a line of text on the screen was sufficient. There is also the inclusion of a timer which adds a certain level of challenge to the game. As frustrating as it is sometimes, it’s interesting to retain it. Otherwise, the game would be simply vehicular stealth as you traverse the city streets which might have been boring after a while. There are also a number of mission types that make their reappearance. One type is the standard “get to a location in a limited amount of time”. Another type is pursuing a target vehicle. There’s also the type of cop evasion where you start with cops on you. All of these modes were interesting in the prequel and, no surprise, return in the sequel. There is also the introduction of new mission types. Most notable of the new types is the mission type where you simply tail someone. Rather than try and wreck the car, you simply follow this car by retaining certain distance limitations. Too far back and you lose the target. Too close and you get noticed. This can be challenging as you follow the vehicle through alleyways and hairpin turns. Sometimes, you have to stop and wait for the vehicle to go on green lights. Other times, you have to floor it to keep up. Challenging and interesting. I thought this was a positive addition to the game. One feature that is both the same and different is the open world concept where you can drive anywhere you like in the city on any level. It was a positive feature in Driver and makes it’s return in the sequel as well. What’s different is the fact that the cities are generally larger than the prequel which gives the player more gameplay options. There’s always hairpin turns, but there is also freeways and smooth turns as well in the road system. One of the most well-cited features of this game is the fact that Tanner can actually get out of his car and take over another person’s car. When this happens, your damage meter and felony meter drops back down. For missions with lot’s of action, but a lot of time, this can be a viable option for you. Tanner is also capable of interacting with the environment, but this interaction with the environment is generally limited to getting and driving another vehicle, opening doors, and placing explosives. It’s present, but on a very limited capacity. I thought the limited capacity wasn’t a bad thing because the point of Driver is that you are driving vehicles in the first place. So, I didn’t really mind this limited interactivity. In addition to all of this is the return of various driving games including trail blazers and survival mode. These minigames helped the replay value of the original game and it’s a good feature to retain in the sequel. However, I felt that some of these games like trailblazers were best left on a closed course with no traffic. Nothing is more infuriating than trying to make certain checkpoints only to have a car completely block your rout, leaving you with no choice but to plow into the car or otherwise run out of time completely. Survival mode is the usual insanity of trying to evade super squad cars that, in this case, are invulnerable and seemingly 50% faster than you. In short, you can’t really be reasonably expected to survive more than 20 seconds very often. It’s less of a question of evasion tactics and more of a question of manipulating the squad car AI to your advantage. I was able to get down the highway at one point and have the squad car gently nudge me forward to the point of stabilizing my cars trajectory. What ensued was the squad car pushing me down the highway at impossible speeds until I made it two thirds down Chicago in 30 seconds, crashing into a police barricade and inevitably dying. Caused me to get a best score of 44 seconds even. One thing I didn’t like about this game was the complete removal of a mission tree. In the prequel, you had an answering machine which sometimes offers you a choice of missions. In the sequel, you have no answering machine and you are simply given the next mission. This made the game completely linear as far as levels were concerned. It was disappointing that the game made this direction development-wise as I thought the way missions were handled was better than this one. So, I felt that this was a step back. Another step back was that the idea of having an apartment with options was removed. Instead, things like a free drive throughout the city was simply relegated to the main menu. While being able to select your starting vehicle was nice, that was the only positive thing I found in this change. One element of this game that I wasn’t a fan of was how some pursuits were handled. Regardless of the kind of vehicle, most chases involve a very specific rout where your target flees. Absolutely nothing, and I mean absolutely nothing, you do alters or changes the flight path. I managed to get in front of a few of them and blocked the flight path. The result is you simply bouncing off the hood and the vehicle continuing on it’s flight path. In a way, it’s like the flight vehicle has the freight train cheat enabled from the original Driver (albeit, less dramatically so). Still, you can inflict a lot of damage if you manage to get in front of the vehicle. On the upside, the kind of vehicle you chase varies which is a nice change. The exception to this is when you chase multiple vehicles. Normal vehicle behaviour seems to return if you have to track down and take down more than one car. One thing that seems to be prevalent in Playstation games that I wasn’t a fan of is the loading screen. Go to the next level? Loading. Finish that level? Loading. Entering main menu? Loading. I thought this was a put off for the gaming experience. Then there’s the added fun of swapping discs part way through. I get that this has the benefit of increasing the capacity of the game, but this can add to the fact that you are working to maintain the gaming experience. Another point of contention for me. Graphically speaking, this game was a disappointment. I found no noticeable improvement in the quality of the graphics even though this game was a two disc game. It’s as if the developers looked at the game and said, “Well, we could improve the graphics over the original to provide a much more enriching gaming experience, but, those are good enough. Let’s just cram more cut scene’s instead and call it a day!” I don’t get the decision to not make any improvements on the overall textures even though this game spent a year in development. I get that it’s an open environment, but it’s not as though this game was being built from scratch either. I’m sure old textures could either be revamped or simply compressed less. After all, there’s twice the capacity of the original game after all. Instead, we’re left with pixelated textures that are only less noticeable at night and in rainy conditions. Then, it’s just motion blur to hide some of the more glaring examples of poor texturing. The only saving grace in this game was the breakables placed throughout the game. I thought that was a positive element. Mixed in with the hubcaps and lighting effects such as the police lights, the graphics in this game wasn’t a total disaster. The audio was hit and miss in this game. The sound effects and voice acting were good overall. One example I liked was the sound effects used to depict a police cruiser breaking down. I sometimes even laugh when I hear that still. Something about that never gets old in my view. The collisions of vehicles were quite realistic in the sound department. Rather than the standard stock sound effects I hear in other games, the sound effects bared a closer resemblance to what collisions actually sound like in real life (yes, I’ve heard cars collide in real life to know, thank you local bad drivers who occasionally find each other on the road). Having said all that, the music was a disappointment to me. With the exception of some of the music in Chicago (the first levels), I found the music to really take a back seat in all of this and, at best, aid the mood of the game from time to time. Sometimes, the music didn’t really fit well with the mission in question, though. Sometimes, there’s some somewhat bright and cheery music in a mission where you are trying to bail out a gangster for whatever reason. It was a little jarring to me. At least the original Driver had some memorable tracks. This game didn’t really have that. Most of the tracks in the game, I found, were largely forgettable. In fact, having spent the a few days playing this game and writing the review the next day, I already forgot what most of the music sounded like. Chicago, as I said, being an exception, though it’s a little weak after a few dozen plays. Generally, this game does retain several elements that made the original such a great game. Examples of this being: an interesting storyline (preferred the original Driver over this game in that area though), interesting types of missions, a few extra’s thrown into the mix such as going for a drive without any objectives or time limit and driving games, police presence that makes the game more of a challenge, the voices of passengers as you careen through the city varying depending on the situation, different weather patterns and times of days affecting how things look, and open environments for you to pick your routes to complete objectives. I felt, though that although things were expanded in this sequel, elements were sadly slimmed down for seemingly no reason (i.e. an apartment you can go through as you assess your options at any given moment between missions and a linear mission tree.). I found that I really wanted this game to exceed what it’s predecessor did, but, in the end, it sort of fell flat and just became a generic sequel. Furthest point in game: Arrested Lenny (beat the game).